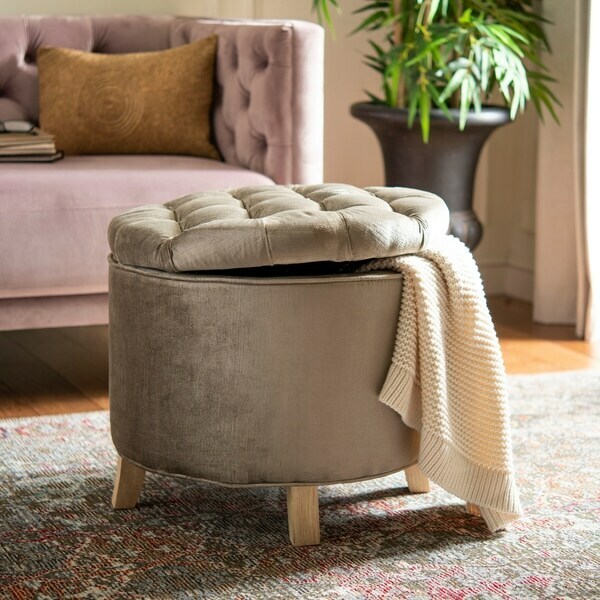 The quintessential storage ottoman, Amelia is transitional indesign with button tufted removable quilted top and oak legs withpretty pickled oak finish. Practical and fashion right, the Ameliatufted ottoman is upholstered in antique sage cotton blend velvet,and striking in living room, family room or master suite. Beautiful fabric. True to picture! I was eyeing this beauty for a few days as an addition to my closet area for a place to sit and put on my shoes. It's the perfect size and the color blends in wonderfully with the rest of my décor. The elegant fabric adds a sense of sophistication, while the light wood and distressed finish adds a casual touch. The functionality of storage is icing on the cake! Perfect! Very pretty. Arrived on time. Completely assembled so I just took them out of the box and they were ready to go. Color goes nicely with my other furniture. Nice addition to my living room. I bought this 3 1/2 years ago, and it is still holding up just fine. I use it in my bedroom by the patio door so the cat can lay there all day and look outside. I can also sit on it just fine without it being unstable, and the storage component is really nice too. The cat uses it as a scratching post, but I don’t really mind because I would rather her scratch that than claw the furniture. The color is a nice muted sage and the fabric is gorgeous. 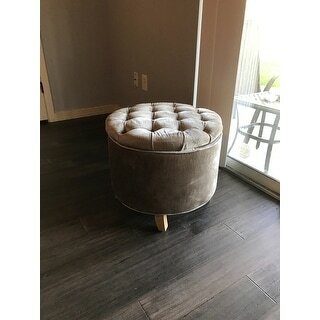 beautiful sage ottoman! love it! This is really a lovely piece for a great price. Comes fully assembled. The fabric and color is beautiful. Exactly as in the photo. Nice storage. Room enough for a couple of blankets. Very happy with this purchase. I was very pleased with the quality of the ottoman. The color is a muted green with a vintage look. It can be used casually in a bathroom or would be a nice accent piece in a living room. Overall I am pleased with my purchase. This ottoman is elegant yet comfortable. The mayerial is so soft, and the pillowtop can be removed to use the ottoman to store books, a blanket, or a small fame or two! The top when turned upside down eorks great as a writing surface or to hold drnks or plates! I use it between two lounge chars in front of the woidstove. I am thrilled with it! Nicely made, beautiful color olive and nice for extra storage. The only problem was one of the buttons came off. It is perfect in our living room. I got 2! they were awesome!, Good storage space and the color is Rich Sage Green. Love it!!! I just love this! It's stylish and perfect for my loft. I too took the legs off, only because my couch is low. It looks great both with or without the legs. The top doesn't always sit on center so I would say it's not uber high quality, but a good attractive and functional piece for the price. Awesome awesomely. I ordered one and then was convinced to order another one because it looked so "royal". It I still more like gold rather than green which looks great! Just what I expected from the description. Very cute and practical. Met my storage needs! Beautiful, sturdy and good storage solution. "Is there a chair to match in the same fabric and color?" Unfortunately, we do not currently carry a matching chair. We apologize for any inconvenience. "Is the color more of a gold or green? " It is closer to a gold tone. 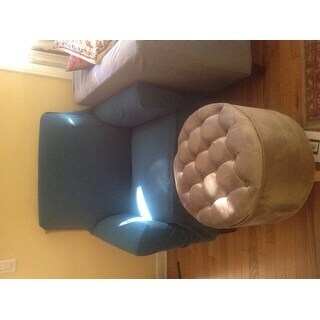 Size, fabric, color is rich and liked the washed oak legs. "Can the legs be removed for use without them? Thanks!" Hello Beachchat, this arrives fully assembled, it's not recommended that the legs be removed. Thanks for shopping with us!